'If the Sun were the size of a grapefruit, Earth would be the size of a grain of salt. Even the largest planet, Jupiter, would be only as big as a large pea.' Some things are so big or so old that it's hard to wrap your mind around them. In If, we look at these hard-to-imagine objects and events and compare them to things we can instantly see, feel and touch. It is wonderful new way of seeing the world and is a fascinating way of understanding numbers and big ideas for children aged 8 and upwards. The author, David J Smith has found ingenious ways of scaling down everything from time lines (the history of the Earth is compressed into a single year! ), to quantitites (all the wealth in the world is divided into one hundred coins), to size differences (the planets are shown as different-sized balls). Each description is beautifully illustrated to reinforce the concept in a child's mind. By reducing everything to human scale, the big ideas and concepts are easier to grasp and, therefore, more meaningful. This fact-filled book is for children who love to be wowed by exciting new facts, figures, stats and information. It is also the perfect vehicle for visual learners, since it's 'infographic' approach makes information easier to understand through imagery. 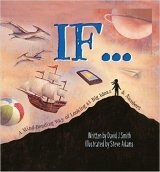 As well as being an excellent read for pleasure, If is also an amazing classroom resource that can be reached for again and again when studying scale and measurement in maths, but also has many applications for the study of space or the earth in science and geography, social studies and PSHE. For those who want to delve deeper, thre are 6 suggestions for practical projects at the back of the book as well as a full page of resource information. Covers topics as diverse as: evolution of man and early life forms, time line of the last 3000 years in history, inventions through the ages, continents, water, energy and population.